I’ve gotten stuck into the first pair of socks made with my holiday-purchased wool. 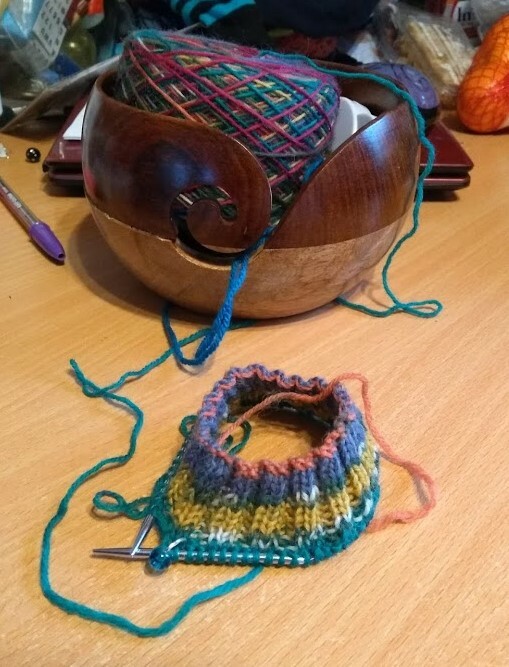 It’s King Cole Zig Zag, but I forgot what colourway and can’t find where I put the ball band… found it! The colour was Wacky, and was discontinued. But at least I found a picture of how it’ll probably look once it knits up, and I’m suitably excited. Even the few rows I’ve done so far are making me want to knit faster to see what comes of it. I was 500% unable to work today, to my minor annoyance. The website that I use to do most of my work was down until after work hours. It’s not the end of the world by ant stretch, but it was a little annoying. I took advantage to make myself get daytime writing sorted out, and then pretty much didn’t do anything else but watch the wind blow outside. It’s started picking up again out there, so enjoyable for me to see/hear, if not enjoyable for people to be out in.